Mike Berry, an introduction ….. Here, you can find, up-to-date news, tour dates & contact details. All CDs bought, can be dedicated and signed by Mike, as per your request. Mike’s recording debut was a cover of the Carole King/Gerry Goffin song “Will You Still Love Me Tomorrow?”, a number 1 hit for The Shirelles. His follow up and first UK hit in 1961 was the sincere and haunting “Tribute to Buddy Holly”, now a pop classic, which earned him the title ‘The British Buddy Holly’. 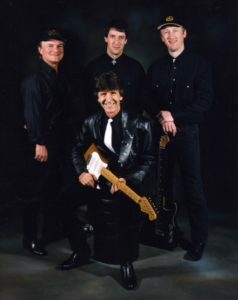 Those who have endorsed that title include Sir Paul McCartney, Buddy’s parents, his original backing band The Crickets, and Buddy’s wife, Maria Elena. In 1962, manager Brian Epstein invited Mike to headline a show featuring a relatively unknown group from Liverpool called The Beatles. John Lennon was so impressed with Mike’s voice and stage presence that he was keen to pen a song for him. However, The Beatles exploded on the music scene shortly afterwards and, sadly for Mike, the song never materialised. In retrospect, John could possibly have offered “Bad To Me” to Mike, but this went to Billy J Kramer, another artiste in Epstein’s stable, who went on to have a number 1 hit with it. Mike’s backing group The Outlaws have been with Mike in their latest incarnation for the last 28 years. Early members of the group included Ritchie Blackmore (Deep Purple) and Chas Hodges (Chas’n’Dave). Mike’s biggest hit “Don’t You Think It’s Time”, written by Geoff Goddard and produced by the legendary Joe Meek, came in 1963. It reached number 6 in the charts. In the 70s, the multi-talented Mike became a TV star, featuring in over fifty commercials and creating the character ‘Mr Peters’ in popular kids show Worzel Gummidge. He also played the role of ‘Mr Spooner’ in popular UK sitcom Are You Being Served?, replacing Mr Lucas (played by Trevor Bannister) behind the men’s counter at Grace Brothers. 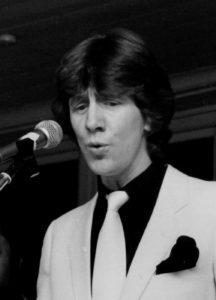 In 1980 he earned a gold disc for his unique rendition of the 1913 composition “The Sunshine of Your Smile”, which remained in the top 10 for 12 weeks. The rest is history, Mike received praise from the public and judges alike, called “A true pro!” and with many positive comments on his “great voice”. His rendition of the Buddy Holly classic “True Love Ways” was released via iTunes on Rollercoaster Records and achieved thousands of downloads. The song was also included on the double Rollercoaster CD, “Sunshine Of Your Smile”. along with his hits from the 80s and previously unheard material, which is available for sale on the CD page of the site. 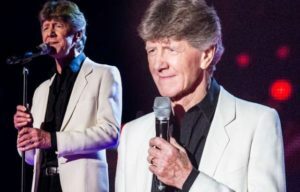 In a career spanning over 50 years, this exemplary rocker/balladeer has never stopped touring, and his extensive rock n roll repertoire is guaranteed to energise and excite every audience. Up to early 2011, he toured extensively throughout the UK with the late great Jet Harris. Since then he has toured concert venues with Marty Wilde and others. He received a ovation at every concert, a testimony to his undisputed appeal, easy going persona, and slavish attention to musical detail, the foundation to which is found in his flawless voice. Mike regards his audiences as old friends, reaching out to them visually and audibly, with an irresistible warmth, humour and innate talent; all of which accounts for his longevity as a top entertainer. While Mike has proved he is more than capable of delivering a beautiful ballad, his original passion was always for Rock’n’Roll, and he is delighted to be sharing this passion with you , his fans and admirers.